Over an area exceeding 500 m², the Tractor on the Move exhibition presents more than twenty types of tractors from both domestic and foreign manufacturers produced from 1917 to 1953. Young children will appreciate our pedal tractors and push bikes with a track designed especially for them, while people of all ages can try out the tractor simulator game (Farming Simulator) or Zetor Major simulator*, which simulates a drive through town or ploughing out in the field. You can take a photo of yourself on selected historical machines. The machines on display come from the Transport and Energy Sources sub-collection, one of the most comprehensive of its kind in Europe. 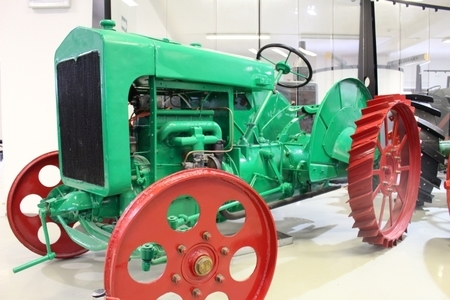 It is stored and presented at the Museum of Agricultural Machinery and Equipment, our Čáslav branch. * Tractor simulator is a subject to a charge. You can buy a token for a 10 minutes period for 40 CZK at the cash desk. When you leave, please return the token to the simulator security. Thank you. You will find the Tractor on the Move exhibition on the first underground floor of the Prague building of the National Agricultural Museum. Partner: N & N Košátky s.r.o. The exhibition has been created thanks to the support of the Ministry of Culture and the Ministry of Agriculture of the Czech Republic.